Next week is Global Library 2.0 Week. Libraries often operate in isolation, particularly school libraries. How can we learn ourselves through the power of networking, as well as help our staff and students connect to learning networks? During the week, consider connecting with another librarian. Join the Global Librarian group, the TeacherLibrarian group, or the Librarian 2.0 group on the Ning network. If you’re just learning some of the web 2.0 tools, check out the School Library Learning 2.0 from the California School Library Association–a self-paced learning guide. Start with the power that web 2.0 tools can bring into libraries–the power to connect, collaborate, create, reflect and share. 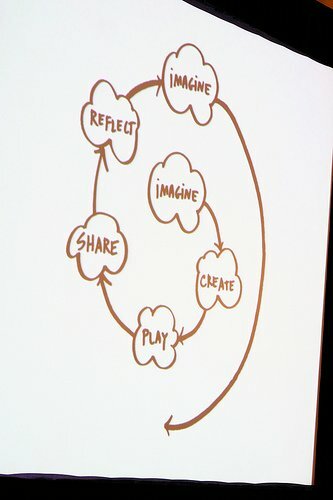 How can we create a library environment that is imaginative and creative, (like Mitch Resnick’s model below) yet purposeful and made for authentic learning experiences and connected to other libraries? Librarians are first, educators, so I hope some “non-librarians” will respond too. After all, web 2.0 tools like tagging make us “all” librarians. Thanks to “Journeys,” I found this – How great this is! I will spread the word to my colleagues who are working on “School Library Learning 2.0” in Denver, Colorado! Okay, I have posted mine. I also used the same pix in my post. Hope you don’t mind. Thanks for the prompt to participate.